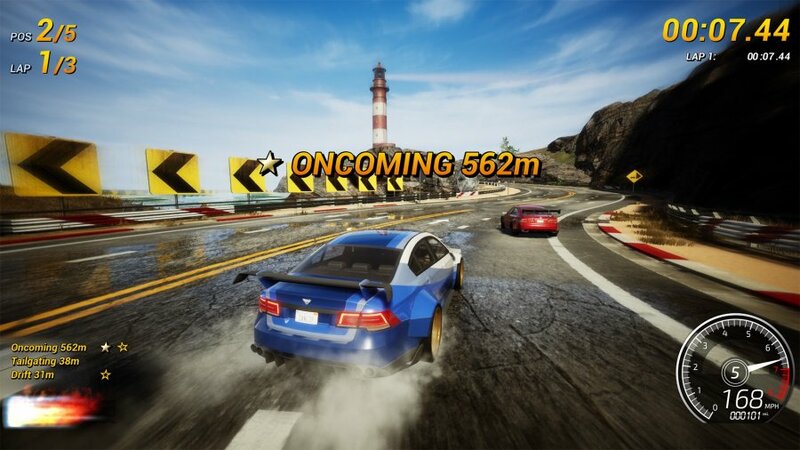 As enormous fans of Criterion's classic arcade racing series Burnout, we've been patiently waiting for either a revival from EA (a pipe dream, let's be honest) or for someone else to crash into the scene with a fast and brazen alternative. That's exactly what Three Fields Entertainment has created with Dangerous Driving, although you'd best pump the brakes on your expectations. Built on a modest budget by a tiny team, this brash racer comes surprisingly close to its inspiration, but it struggles to keep up where it counts. Clearly aping the excellent Burnout 3: Takedown in its presentation, the game is a pretty straightforward one: you're provided with a generous number of events, and it's your job to boost, drift, and smash your way to victory. The Dangerous Driving Tour campaign is what's available at launch, but it packs in plenty of variants on the action, and swaps between a handful of modes to keep things interesting. Primarily, though, your aim is to go as fast as you can for as long as you can, and that of course involves racing recklessly. Doing so earns you boost, and there are plenty of ways to achieve this -- drive into oncoming traffic, get close to pedestrian vehicles, drift around bends, and so on. Takedowns are also very much in. Though you can't perform them in every event type, the ability to shunt your rivals into traffic, barriers, and each other adds a lot of spice to the already frenetic races. That you can be slammed out of the race as well heightens the tension, as you all scream along at 200mph, dodging and weaving through traffic in a bid to turn each other into scrap metal. It's aggressive, satisfying, and ultimately, still a lot of fun. 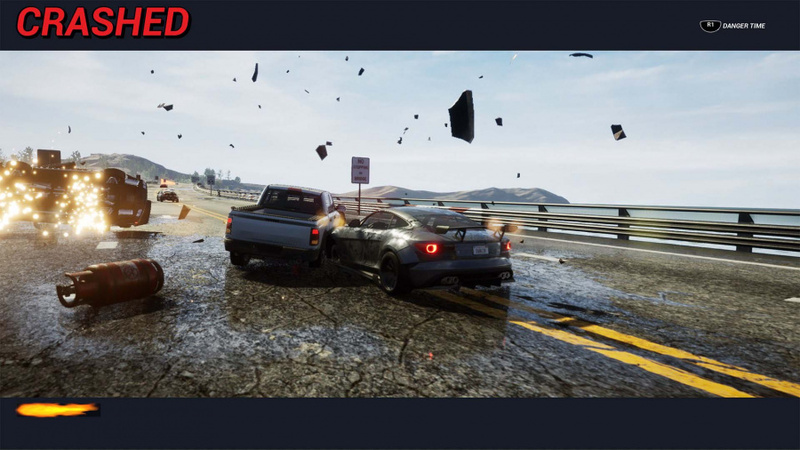 The game certainly recalls memories of the first few Burnout titles with its selection of modes. Survival feels like a throwback to the very first game, tasking you with driving as long as you can without crashing while checkpoints top up a short countdown timer. Heatwave races eschew takedowns in favour of boost chaining, where you must fill your boost bar and expend it all at once, which will fill it back up again. This is certainly reminiscent of the first couple of titles. Pursuit mode, in which you chase down baddies in a police car, makes a return from Burnout 2: Point of Impact, and of course, Road Rage is ripped straight from the third entry. With the developer's staff strongly tied to Criterion's series, there's absolutely no shying away from what it's shooting for here. But while the variety of modes is good, and the overall feel is extremely evocative, we're not entirely convinced by some aspects. Vehicle control is generally okay, and the sensation of speed is great, but drifts are clunky. Sliding through corners feels decent once you're sideways, but entering and exiting a drift feels inconsistent. There are also issues with collisions. You're likely to end up riding the outer barrier on a bend, but this can result in some strange clipping that sends your car out at a bizarre angle, or you could be spun around, or forced to a standstill. There are also a lot of bugs right now. We've seen traffic on the wrong side of the road, traffic disappearing into the asphalt, and our car launched into the sky after what should've been a head-on crash. Factor in some poor performance on a standard PS4, and it's technically quite rough. 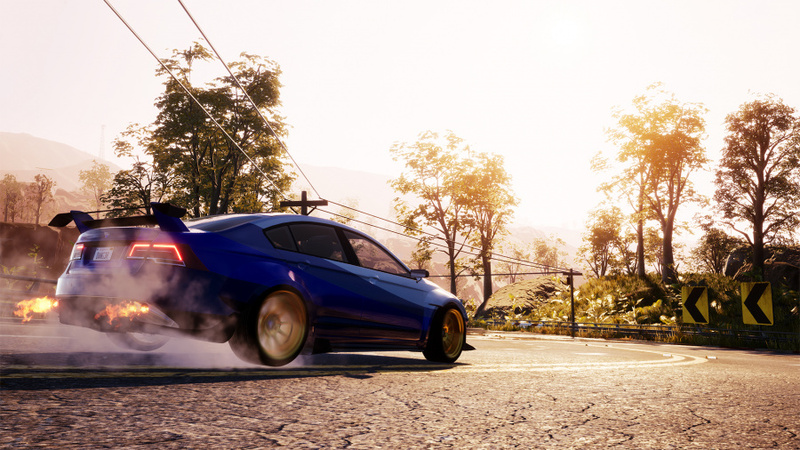 It's a massive shame, because the general feel while you're screaming across the handful of tracks is good; boosting along, taking down opponents, dodging traffic -- it's simple fun, and comes closer than you might think to capturing the magic of Burnout. In fact, it goes beyond it in some ways; persistent wrecks litter the course as you take out other racers, making the race even more hazardous, and Spotify integration means Premium members can control their playlists in-game, both smart additions. What we're left with is a scrappy arcade racer that does a good impression of Criterion's franchise, but misses the mark in a couple of key areas. That's not to say there isn't fun to be had -- this is more than capable of providing some insanely speedy thrills -- it's just very rough around the edges. Honestly, the gameplay video I've seen tells me something is seriously off with the physics. This is a no buy for me until multiplayer & fixed physics. Was this reviewed on a PS4 or PS4 Pro? There is quite a difference between the two machines as the Pro us targetting 60fps whilst the base is 30fps. The Pro is 1080p only but its double the frame-rate. The base version also has poor frame pacing issues. The 30fps and frame pacing issues or virtually locked 60fps would change the review because the game would feel and play quite differently. I am not criticising anyone, but I think that you should perhaps state the Console it was reviewed on or perhaps have a paragraph where you discuss the differences between PS4 and PS4 Pro. It may not be necessary for some games, if all they are doing is boosting the resolution, but if they do have vastly different feel such that double the frame rate with no frame pacing issues (an odd blip here and there) compared to 30fps that feels and looks juddery because of the frame pacing problems, I think its important to at least state the console its reviewed on. If you don't review both console versions, it lets us know that the reviewer is basing their opinion on a specific console. It covers the reviewer from people who buy the game (or not) and having a 'different' experience. If, for example, you review the Pro version, base PS4 owners may buy thinking that the game runs 'smoothly' at 60fps for example - maybe even getting a higher score as a result or if you say the game is sluggish and juddery for a fast paced game, you may score a game lower and put people off who own a Pro. @BAMozzy "Version Reviewed: PS4 (Standard) / European"
For the record, I think this game probably would play better in 60fps, but that doesn't account for other issues. Plus, I've heard that the Pro version isn't perfectly stable, anyway. Man, just started playing this and what a disappointment. The handling is terrible, the cars feel like they have no weight (had to turn the handling from 7 down to 2 just to stop veering all over the place) and opponents seem to magically skitter around the track. No music in- game ruins the atmosphere of an arcade racer. It looks like burnout, just completely misses the mark. Love to see the handling updated and music added but I doubt that will happen with such a small team. @Quintumply I have NEVER noticed that before, I always look under the Picture to the start of the Text and read on from there. Thanks for pointing that out. According to Digital Foundry's assessment, the 'best' (most stable and virtually locked to 60fps bar the odd dropped frame here and there) is the PS4 Pro version. That is 'better' than both base consoles from this generation and the Xbox One X too - although it is running at 1440p so it has a 'visual' advantage but not a smoother experience. I don't know what issues you are referring to in particular as far as 'performance' metrics are concerned, I am certain it has the same 'issues' as far as everything else - the menu's, the tracks, the cars etc. I don't own the game myself but the game, at least as far as performance (which greatly affects handling and feel) that Digital Foundry have assessed seemed to have far fewer technical problems that you appear to have with just the base version. Again, not a criticism at all. Now I know the version tested, it reads much more like the findings of DF on the base consoles. I am not saying that IF you were to 're-review' but on a PS4 Pro, things would be significantly better - maybe an extra point, maybe not. Looks decent but not $30. I'm sure this'll be in a flash sale or on plus soon enough will pick it up then. Thanks for the review! The only concern for me is the technical issues, if they can fix it somehow I might just be interested. I saw GiantBomb test it out on the PS4 and it looked fine as far as framerates go, but they probably ran it on the Pro. @Bonbonetti Which game are you referring to? 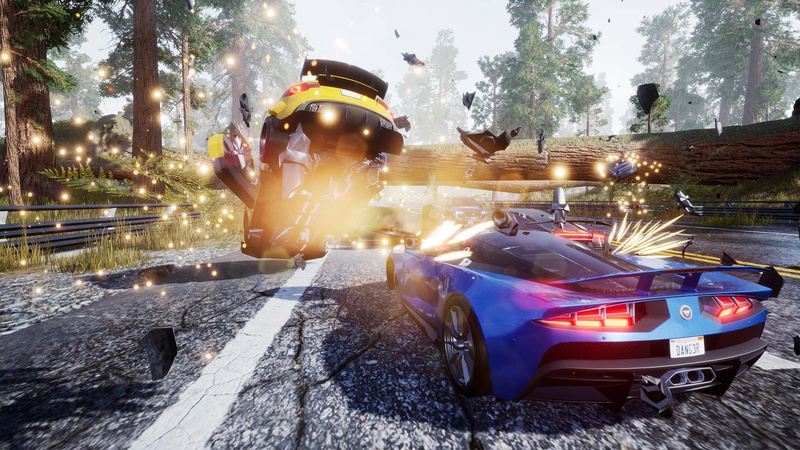 @Flaming_Kaiser Burnout was great, I bought Danger Zone and Dangerous Golf previously, maybe they could have dropped the resolution to improve the framerate on the 'base' version. I'm no programmer, but that seems a common trade off with modern games. Still a must buy for me as a huge fan of the Burnout series. I am sure many of the technical issues will be patched. This really looks like blast to me but I'm balking at $30, I hate to do this to an indie dev but I need to wait for a sale. This is what happens when you have a small studio with a smaller budget and Big Game dreams. Burnout is a Big game and deserves the budget and talent afforded as such. This is an embarrassment to your history. I would love a new racing game, but I'll be passing this by. Also: Assetto Corsa 5/10, RIDE2 6/10, TT Isle of Man Racing 5/10, V-Rally4 6/10, NASCAR Heat2 6/10, Sébastien Loeb Rally 6/10. Of all possibly genres, it's just odd to me that a racing game with apparently rather serious technical issues can easily outscore or be equal to racing games that have no significant technical issues. If this was any other genre it wouldn't really bother me, to each his own and all that, but with racing games the technical performance is especially important, you need a game that runs smoothly. I preordered. Even if I just get several hours of single player vehicular mayhem out of this, I’ll be happy. I really wanted to support the developer, and arcade racers in general. @Bonbonetti Well, I mean it's not like Stephen's turned in a 10/10 here. He's very critical. This is unfortunately a hard pass for me. All the previews and now reviews show its not the game I was hoping for. From the first trailer it felt off and it seems it stayed that way. If they release a demo I would try it to see for myself, but as it stand now, it's a no. Having great fun with this, well worth the asking price in my opinion. Not to disrespect anyone's opinion, but why do people talk of Takedown as the best in the Burnout series??? Personally, I felt Revenge was miles better. What are other's opinion on this??? @shuvamg009 Revenge is my favorite of the series. Would have preferred a remaster of that over paradise. Haha, Burnout 2: Point of Impact on the Gamecube - purest version! @shuvamg009 Takedown is my personal favourite, but Revenge is a close second. Burnout 3 was the first of the series I played, that probably has something to do with it, but I agree that Revenge is often overlooked! I'm loving this so far. Road Rage feels as intense and insane as it ever did. I played it on loop at least 20 times last night. Got 19 takedowns in one round. I like the Spotify integration too. Already had some playlists which fit the action perfectly. 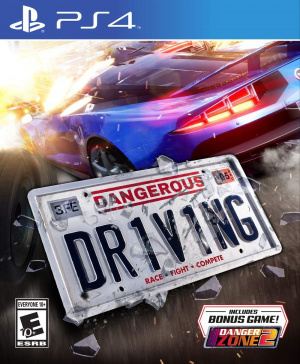 I love the Burnout series and this game has lots of potential.